The sound of Jupiter, the largest planet in our solar system, is F sharp, the appropriate colour, magenta red. The fundamental tone is a segment of the natural scale. All wood parts are carefully oiled and waxed and crafted mainly of alder. The natural teardrop shape of the pendulum adds to the harmonious design. Size: 110 cm, tube max. 60 cm. 550 g.
The sound of Jupiter, the largest planet in our solar system, is F sharp, the appropriate colour, magenta red. The fundamental tone is a segment of the natural scale. Available in matt silver. All wood parts are carefully oiled and waxed and crafted mainly of alder. 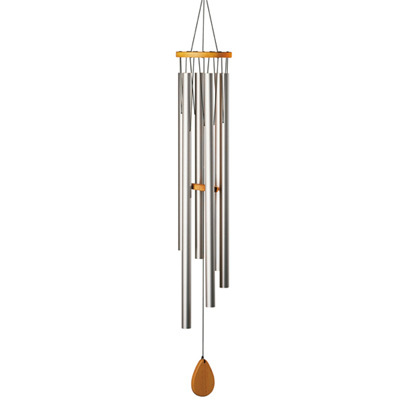 The natural teardrop shape of the pendulum adds to the harmonious design.